When it comes right down to Hannibal Lecter, the films that he plays a character in aren’t really horror, as I have been reviewing lately, but his character is. Now, like many of you, I have watched all of these films before except for the first film, which is often overlooked. Manhunter is overlooked quite often due to the fact that the “face” of Hannibal as we know it, Anthony Hopkins, wasn’t the one playing the cannibalistic killer. Instead, we have Brian Cox. Both parts are done very differently, but I have actually seen some reviews that favor Cox’s performance over Hopkins. We’ll see about that. After being pulled into a string of serial killer cases, Will Graham (William Peterson) must figure out how to track down a killer that apparently picks his victims out at random. His technique into finding criminals includes being able to distinctively dive into the killer’s psyche, almost losing it himself. To aid him in the search for the truth, he consults with Dr. Hannibal Lecter, a cannibal he tracked down years before. Can he find the killer before Hannibal succeeds in messing with Will’s mind? I know this is technically the first film to actually introduce the world to Hannibal Lecter, but I’m going to go bold and say that I personally don’t consider this a Hannibal film. There’s a few reasons why this is. First of all, I don’t think anyone can fill the role as conniving and tense as well as Hopkins can. Brian Cox just seemed like a smart and sane guy. Sane being the opportune word. Evil, yes, but absolutely sane. In that way, he doesn’t quite get into my head and stay there. Next, Hannibal wasn’t even focused on much in the film at all. Now, the same can be said for Red Dragon, but his popularity awarded him with more screen time in the newer film. In the end, I’m afraid to say it, but I found this to be procedural and sleepy. The movie actually has a great story and mystery, but I just wasn’t invested in the story as much as I probably should have been. Peterson did a wonderful job playing one of the best interpretations of Will Graham ever. You could tell the man is just hanging by a thread of going insane himself, he can get into the killer’s head because darkness is apparently dug itself deep into his soul. However, I’ve been spoiled by seeing Hugh Dancy’s interpretation in TV’s Hannibal, which really nothing can beat. That being said, Peterson still had the look and the right personality, and I can appreciate that. From what I can recall, Edward Norton did well in his interpretation, but this was more honest in accordance to the character’s original intention. He’s smart and gets into the killer’s psyche. That can be chilling for the right audience. A huge distraction in this film was also the inclusion of the cheesy ’80s music that just wouldn’t quit. I thought I was watching an old soap opera or something most of the time. When it comes down to Hannibal, I want my mind to be messed with, I want to dream about Hannibal breaking into my house and forcing me to eat my own brains. I want a sick and twisted film with the most disturbing villain. That’s the thing. Hannibal is easily a love-to-hate villain, yet I just find myself hating-to-hate this one. Manhunter at least introduced us to a well-known villain, and it was a good enough story to warrant a revisit to Hannibal’s world, but as for this one…I’m glad it’s over. The style for this movie was pretty rad, however, I do have to say that it does get a bit dry somewhere in the middle. But thankfully Tom Noonan came in to save the day. Good review Dave. Dave, this seems to be a very biased review. Clearly you had some high expectations for this film, which is okay..
Maybe you just love Hannibal the TV show… I don’t know. I do agree with one point you made about the cheesy 80’s music. 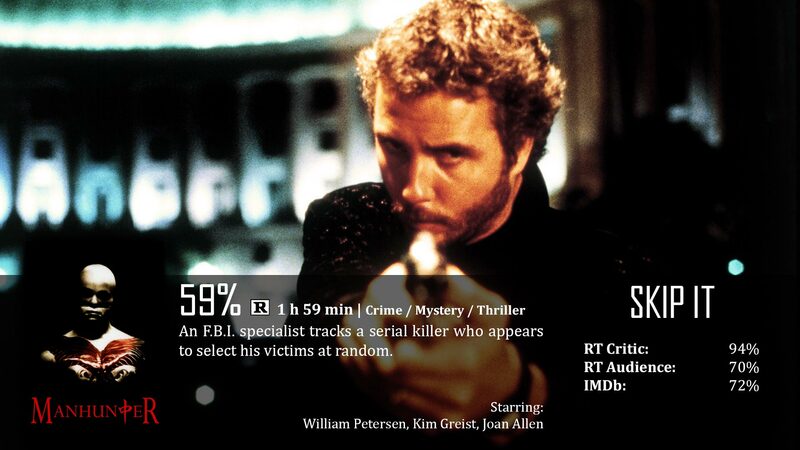 Overall, I think this film was way ahead of its time and still holds up today as a great suspenseful thriller. 59% is a slap in the face for how well done this movie was. You may have a point. It was four years ago that I wrote this, before I implemented my current scoring system. Maybe someday I’ll get around to re-reviewing this film.